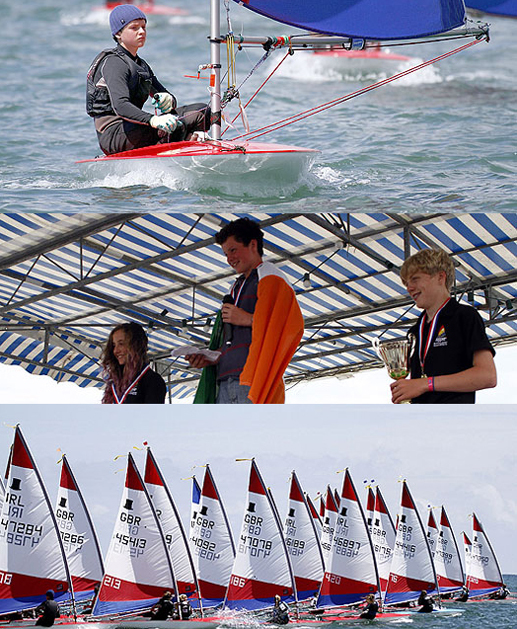 #sailorofthemonth – Ballyholme YC teenage helm Liam Glynn is the Afloat.ie "Sailor of the Month" for July after his comprehensive victory in a fleet of 102 boats at the Topper International Worlds at Loctudy in France in an intense week of racing at the Brittany venue from July 22nd to 26th. Glynn arrived at the championship on top form with Silver already notched at the Youth Nationals earlier this season and a win at the Topper Nationals in Donaghdee in July. But he showed his quality in depth by turning in an even better performance in France, despite very different conditions. The Championship had been raced on the tide-free freshwater location of Lough Derg, but the Worlds were sailed in notably tidal salt water with often flukey breezes, and a sometimes lumpy sea state which was not always warranted by the wind strength. Yet despite the huge fleet, the young Belfast Lough sailor put in the sort of consistent performance which is the ideal of any top skipper, senior or junior. His first four races were all top three placings, including two straight wins, which meant that as the series progressed he was building towards a comfortable cushion of 13 points over the next boat as the final day's racing arrived. As it turned out, his work was done. The final day of racing was lost to calm, and Ireland has a new World Champion.